The most recent component installed to expand our Metrological capabilities is a Super thermometer. This thermometer has a readability of ±0.0001°C or better with the overall accuracy at or less than one millidegree (0.001°) C. This, coupled with a recent project focused on upgrading our test facilities in accordance with ISO Guide 25 allows us the capability of comparison calibration at the millidegree level from -40 to +100°C. The planned addition of a few natural physical constants, coupled with those we already possess, will allow U.S. Sensor Corp.®, acquired by Littelfuse in 2017, to perform calibration with expanded uncertainties at or near that of The National Institute of Standards and Technology (NIST). 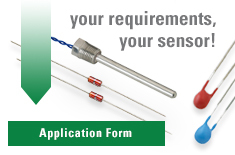 "Our goal is to be the best thermistor manufacturer in the world, with a strong commitment to quality and a continued vision to the future"